My boyfriend (Adam) bought his first home, a 2 bed maisonette in a sought after location in Southampton…and he got it for an amazing price. The reason being it hadn’t been touched since the 60’s…I’m talking wood chip wall paper, artex ceilings the lot. It’s taken us a long time to get to where we are, but we’ve done it all on our own…with help from Malc, Adam’s overly talented at all things DIY Dad. We’ve plastered, sanded, painted, decorated…and designed! We love the industrial look, but we also love the cosy countryside look and we’re attempting to combine the two. 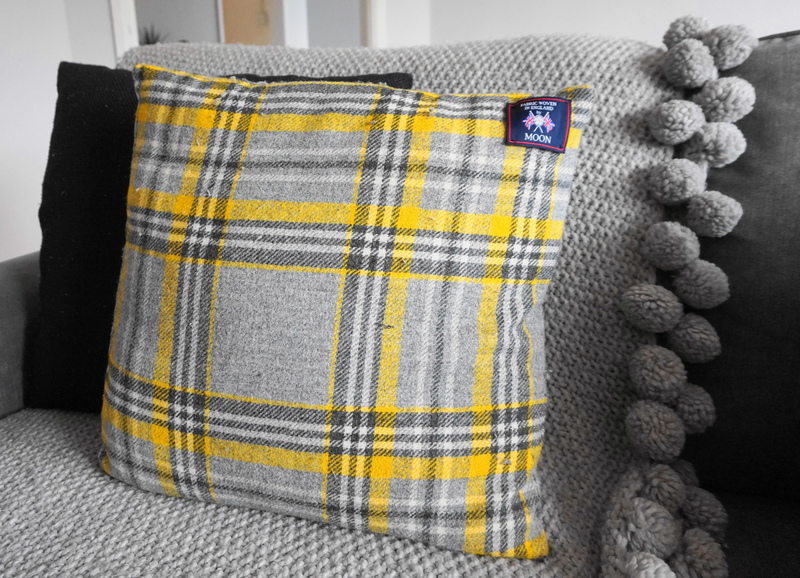 Our colour scheme is different shades of warming grey with yellow accents – adding the yellow through accessories such as our cushion from M&S (below) and always having a fresh bunch of yellow tulips or daffodils. Our paint is from Valspar – chimney breast is Rocky Mountain Mist & the main walls are Grey Morn. Both greys are light but cosy. They give our small room that sense of space. 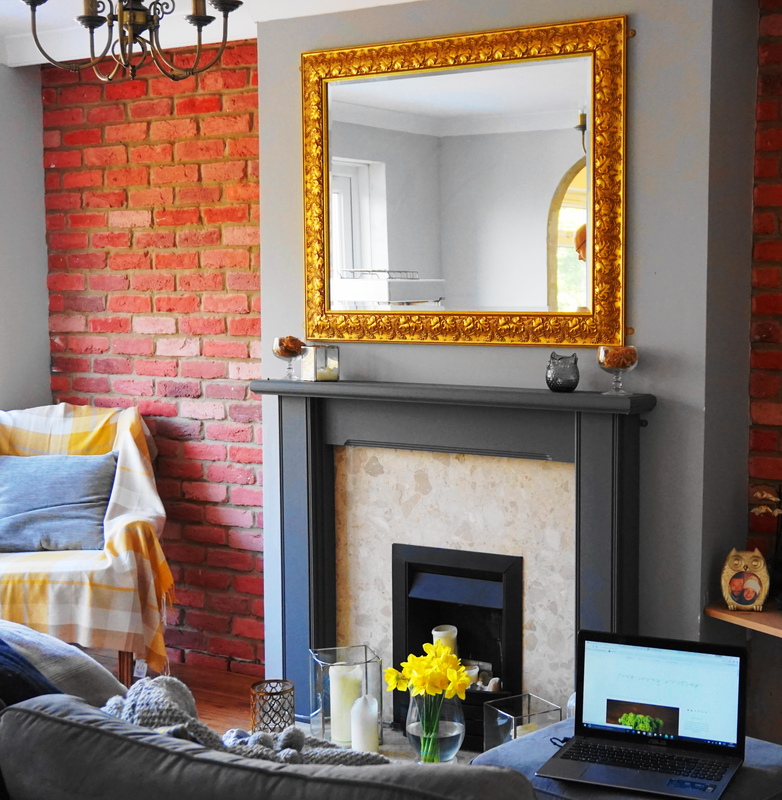 Adam was set on having exposed brick in the living room, we wanted it to look authentic so we took the plunge and ordered some brick slips from eBay. They’ve given the room that slight industrial feel and just look so stylish. To add some extra character we also added coving. Our fire place. It was modern, stainless steel and ugly. We don’t have the budget for a new one so we’ve (well, I. The fireplace is my baby) have given it a make over. First step was to get rid of that shiny stainless steel, so I spray painted it black using heat resistant spray paint. If you’re planning to try this, remember to wear a mask & cover up the areas you don’t want to colour. The fireplace is gas, we would never put the fireplace on so I removed the horrible fake rocks, placed some foil over the pipes for protection and added three pillar candles – it gives the room a romantic feel. To finish I painted the pine mantle piece using a Valspar tester pot in Elephant Grey. 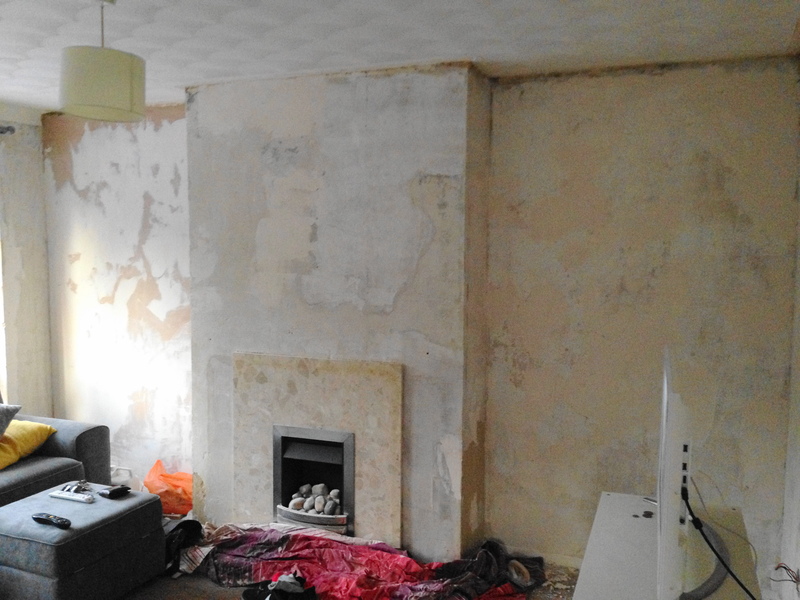 Below is our before shot…we lived in that for our 3 months, but it was worth it. We’re still adding accessories to our living room to make it feel like a home. Our mirror was an antique hand-me-down from my mum which I think sets off the whole room. We’ve purchased an industrial style lamp from Next to incorporate that particular style into our home. We’re planning on adding shelves to the brick walls which we’ll be filling with ornaments, books and, of course, candles! Where the arm chair currently sits (which we found and covered with a Sainsburys throw!) we’ll be adding a table to create a small dining space. Our next project is the kitchen – blog on our inspiration & progress coming soon! Previous Veggie patties – Greek style! Next Greek up your butter beans!